Sonos added another major music service to its internet-connected loudspeakers Thursday, and this one comes with a twist: Google Play Music users are now able to cast songs and playlists directly from Google’s (S GOOG) music app to their Sonos speakers, much in the same way they would also cast media to a Chromecast adapter. Users still need to have the Sonos app installed on their mobile device to make casting work, and they can elect to use Google Play Music through the Sonos app instead — it recently introduced universal search across music services. Either way, music is played directly from the cloud, which means that songs keep playing even of the phone is turned off. The Google Play Music app allows users to launch playback on a single speaker or a group of speakers, but doesn’t offer a way to group speakers yet. Casting is so far only available on Android devices, and Sonos senior product manager Kristen Bender told me earlier this week that the company doesn’t currently have a firm date for bringing the feature to iOS. Support for Google Play Music will be available in 25 countries, matching the availability of Google’s All Access music subscription tier. 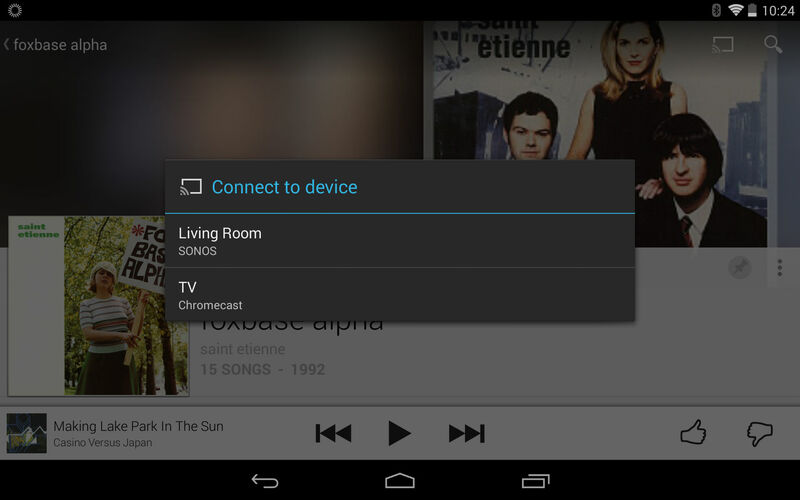 However, Sonos owners don’t need to subscribe to All Access to use the app in combination with their speakers. Instead, they can also use Google’s free cloud locker to cast their own recordings. This is the first time Sonos has enabled this kind of third-party app support for a music service in the U.S. Up until now, users always had to use the Sonos app to play any music on their speakers. And while that app saw a significant refresh a few weeks ago, it’s still not a full replacement for native apps, which tend to have more custom features. Sonos began its path towards third-party app integration last year, when it enabled users of China’s QQ messaging service to launch music directly from an IM conversation. Bender told me that the company plans to bring direct casting capabilities to additional services in the future.